Lost Lake. Friday morning sunrise. So this happened at Lost Lake on friday morning... Unbelievable sight to see! It was a clear and calm Friday morning as i wake up to my 5AM alarm. I look out the lodge window and don't see a single cloud, Thinking to me self that it wasn't going to be an interesting composition. So i tried to go back to sleep. 15 minutes go by and i couldn't do it. So i decide to walk out to the viewpoint anyway. As i come around the corner i am surprised immensely at the scene. Mt Hood just barely visible through the morning mist. I find a composition and not 10 minutes later that Mt Hood has started to put on the morning show. The view was breathtaking, Unbelievable. It felt as if i was still asleep at the lodge and dreaming. 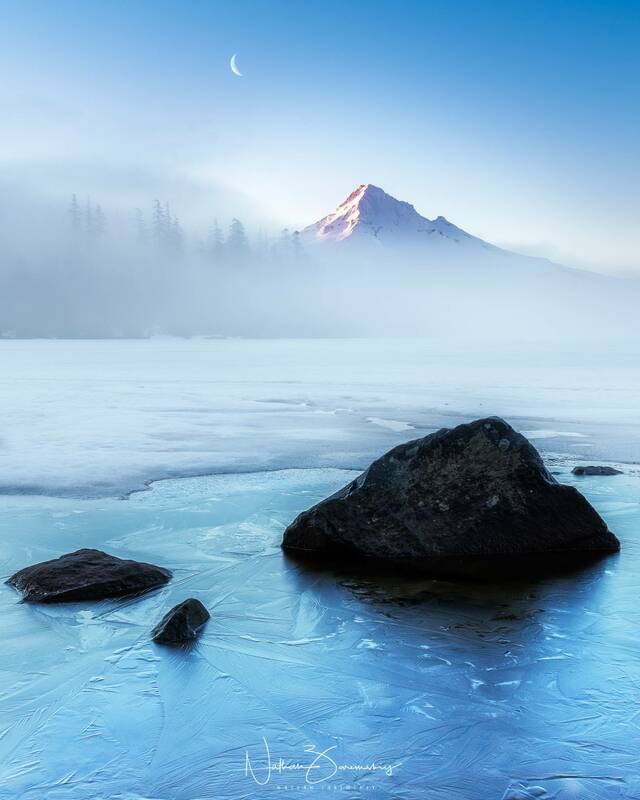 The gentle alpine glow of the mountain reflected on to the thin layer of ice. A morning i will never forget. Re: Lost Lake. Friday morning sunrise. I would definitely hang that on my wall. Love it. Incredibly beautiful. I believe you, it must've been hard to believe you were actually witnessing this! Oh! Just when you think you've seen it all. Very very nice. Thank you for the comments everyone! Feel free to come up! We open monday!